Gibson L-4 Model Arch Top Acoustic Guitar (1930), made in Kalamazoo, Michigan, sunburst top, dark stained back and sides finish, birch back and sides, spruce top; mahogany neck with ebony fingergoard, original black hard shell case. This is a very interesting, fairly rare, and great sounding guitar - an oval-soundhole L-4 from the last days of this original 1910's design for the model. It is generally similar to the earlier 1920's L-4s but with a much more comfortable wide round-backed neck in place of the earlier "V" style, and a somewhat thinner top carve. It has all the other new features introduced by Gibson in the 1920's including the adjustable ebony bridge, truss rod neck, and solid bar "string over" tailpiece in place of the earlier pin variant. Within a year of this one being made the L-4 was down priced and made a plainer round-hole model with a modern 14-fret neck joint and many other changes. Built not too long after the change-back from the "snakehead" Loar-designed headstock, this guitar features a straight "The Gibson" logo on its single-bound peghead above the truss rod cover. The top and back are single bound; the soundhole has a bound rim and is bordered with a center W/B/W marquetry strip and multiple rings. The sunburst on this top has the older Gibson hand-rubbed character; it is slightly "redder" than the Cremona Brown used on early L-5's but has much of the same look. With a large 16" wide body and carved top and back, the L-4's combination of steel-string power and punch with a round soundhole was unique. In 1930 it was unlike any other guitar available, although many other makers were rushing to market instruments "inspired" by it. Martin offered their C-series right around this time, very much inspired by the L-4 with Regal and others soon to follow suit. 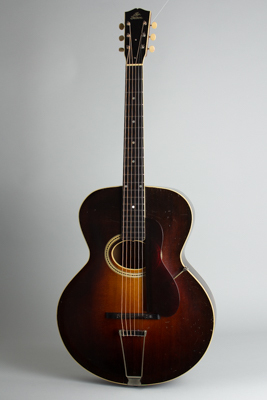 The L-4 did not top the 1930 Gibson line, but it was still a fancy high-end guitar for this early-depression era costing $150 with only the $275 Master Model L-5 exceeding it in price. Only a working pro could afford such a guitar, so they were not made in large numbers. Many early jazz greats used very similar L-4's extensively in the late 1920's and early '30's, including Eddie Lang and Freddy Guy with Duke Ellington's Orchestra. Besides being a considerable rarity, this late oval-hole L-4 is a very powerful-sounding guitar with a big open tone, and the nicest of these we have had. Overall length is 39 in. (99.1 cm. ), 16 in. (40.6 cm.) wide at lower bout, and 3 5/16 in. (8.4 cm.) in depth at side, taken at the end block. Scale length is 25 in. (635 mm.). Width of nut is 1 3/4 in. (44 mm.). This is an amazingly clean and original guitar, especially considering its age. The finish still shines and shows small dings and scrapes but remains original with no overspray or major loss. There is an odd stain on the side lower treble bout, and light checking overall. There appears to be a barely visible spruce grain crack to the top just off the bass side of the tailpiece. The original thin-wire frets show a bit of wear but are still fully playable. The only alteration to the instrument is a new perfect reproduction ebony top to the adjustable bridge-the original was long ago cracked beyond repair. All other hardware is as it left Kalamazoo in 1930, including the very nice original hard case-that incidentally also holds an L-5. A spectacular example of a rare, cool and surprisingly fine sounding guitar. Excellent Condition.